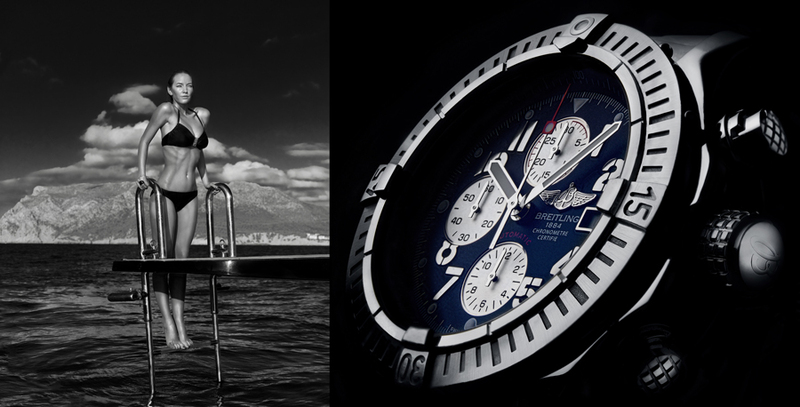 This week saw Commercial Photographer Tim Wallace signed by Celebrity Speakers in Europe. The company have offices Worldwide and approached Tim a few months ago after hearing about some of the seminars that he had given including the 'inspirational and motivational' one in Wales recently for disadvantaged children. 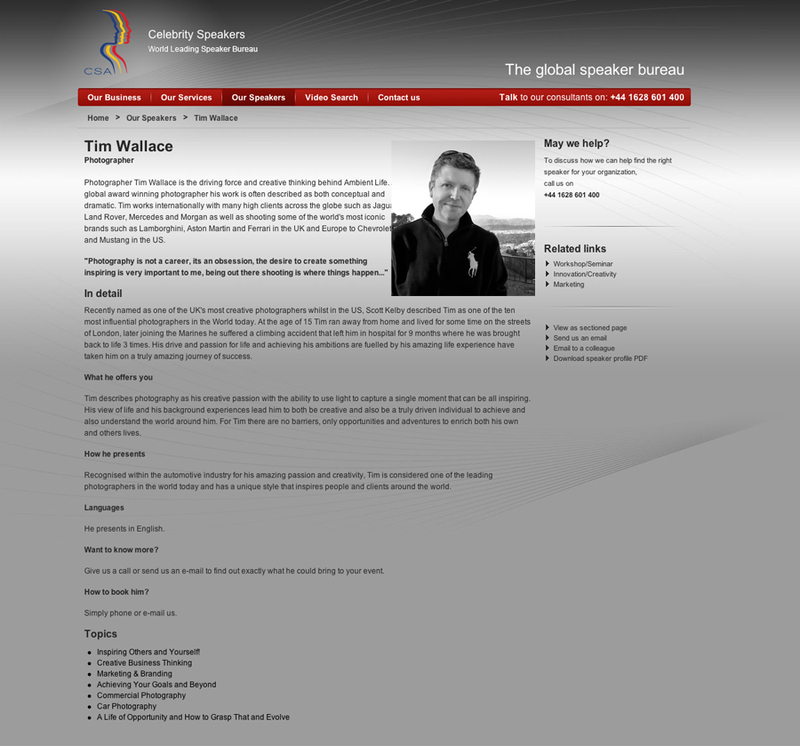 Tim is now featured on their global site and already has a booking for a large corporate event being held in Madrid in November this year where he will be delivering a talk. Tim - "Earlier this year I made a decision that I wanted to try and do more 'inspirational' speaking as I really enjoyed it and it seemed to be something that people enjoyed listening to and connecting too from me. What I did not realise at that time was that a organisation that specialise in this form of 'motivational and inspirational' speaking were already aware of my seminars and the reputation that was building around these. A few months ago I decided to do a charity talk to raise money in Wales with Cambrian Photography, this went really well and I was very happy to do it of course because it was simply the right thing to do. Recently they started to talk with me and today they launched me into their sites in the UK and Europe as a Inspirational and Motivational speaker! In truth this is very surreal and sort of blows me away totally, can't still now quite get over this as I sit now with people like James Cameron, Bob Geldof and Sir Sirling Moss not to mention Olympic gold medalists like Rebecca Adlington and David Coulthard but i feel very privileged to be in such good company and I look forward too making new friends and meeting new people. I have my first speaking engagement in Madrid at a Racing event later this year and I will most likely spend the next few days trying to take this all in ! I came from nothing 7 years ago and all I did was find my own path and work hard for what I believe in, so what am I saying here, be true to yourself, believe in yourself and if you really want something then GO FOR IT regardless of what anybody tells you, and most of all along that journey do good things for people be cause Karma works both ways and life is not about what you can get, its about what you can give"
"Photography is not a career, its an obsession, the desire to create something inspiring is very important to me, being out there shooting is where things happen…"
Recently named as one of the UK's most creative photographers whilst in the US, Scott Kelby described Tim as one of the ten most influential photographers in the World today. At the age of 15 Tim ran away from home and lived for some time on the streets of London, later joining the Marines he suffered a climbing accident that left him in hospital for 9 months where he was brought back to life 3 times. His drive and passion for life and achieving his ambitions are fuelled by his amazing life experience have taken him on a truly amazing journey of success. Tim describes photography as his creative passion with the ability to use light to capture a single moment that can be all inspiring. His view of life and his background experiences lead him to both be creative and also be a truly driven individual to achieve and also understand the world around him. For Tim there are no barriers, only opportunities and adventures to enrich both his own and others lives. Recognised within the automotive industry for his amazing passion and creativity, Tim is considered one of the leading photographers in the world today and has a unique style that inspires people and clients around the world. The founding vision of CSA Celebrity Speakers was that ‘high achievers inspire others’. 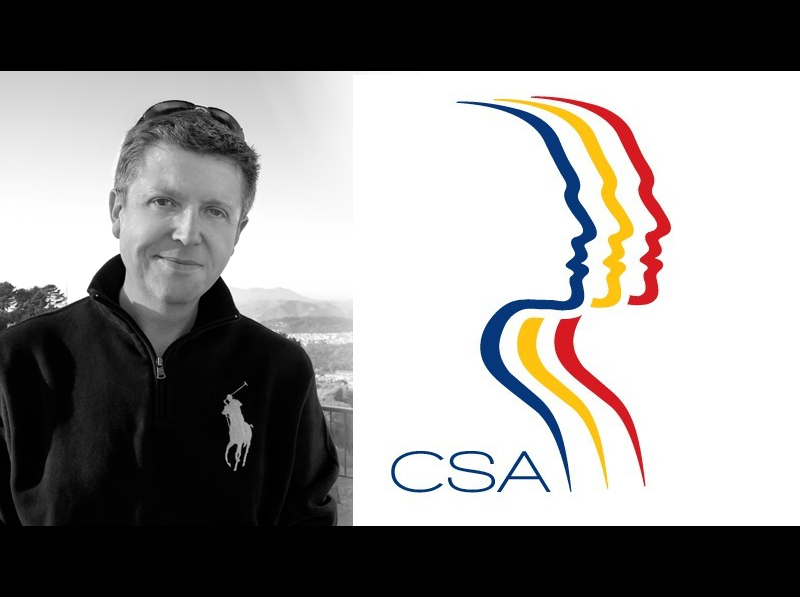 From the start, it has been CSA's mission to bring businesses together with these high achievers knowing the profound impact and influence they can have on the performance of a company. Their speakers have been inspiring and enlightening audiences around the world for over 25 years, bringing with them new and fresh ideas, stimulating change and growth within each organisation. Their mission is to continue helping businesses achieve their objectives by connecting them with the best minds in the world. They are committed to delivering outstanding customer service, expert advisory services and only the best speakers, thought leaders and personalities who will inspire the change you require. Accenture,Aviva,Barclays Bank,Bayer AG,BMW,British Airways,British Telecom,Cadbury, Schweppes,Cap Gemini, Ernst amp,Young Group,Coca Cola,Citicorp,Dell Corp,Deloitte & Touche,Deutsche Bank,Deutsche Telekom,Ericsson,Ernst & Young,Fonds Professionell,GlaxoSmithKline,Goldman Sachs International,Hewlett Packard,IBM, ING,Johnson & Johnson,J.P. Morgan,KPMG,Legal & General Group,Lloyds, McKinsey & Company,Mentor Graphics,Microsoft,Motorola,Nokia,Oracle Corp,Pepsico International,Pricewaterhouse, Coopers,Reuters,SAP AG,Schroder Investment Management,Shell International,Siemens Group,Small World,Sun Microsystems,The Cabinet Office,The Economist,Unilever,Vodafone, Xerox. CSA provide the most influential people on the planet to inspire, educate, motivate or entertain. It's what they do best and what they've been doing since 1983. In those early days, they were pioneers of the speaker industry in Europe. 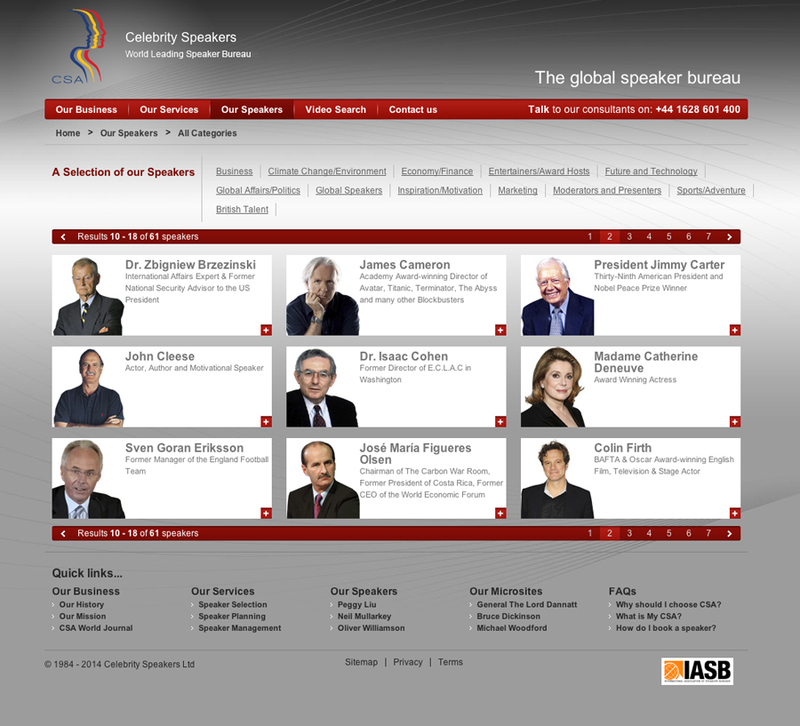 Today they are a world leading speaker bureau. 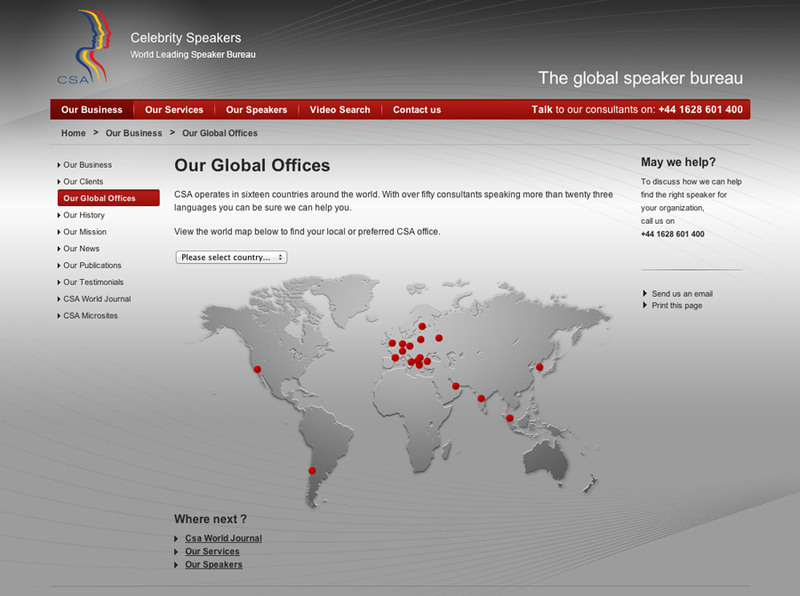 With offices in sixteen countries we represent leading thinkers and can connect you to virtually every personality in the world. Their consultants have a reputation that precedes them. They are renowned for providing the highest levels of customer service and advice when selecting a speaker, and why they continue to retain our world-class clientele. When you choose CSA, rest assured, you will be working with the best in the business. High achievers inspire others. This was the founding vision of Alex Krywald back in 1983 when he brought Celebrity Speakers to life. A pioneer and high energy individual, he knew that by connecting businesses to the world's most outstanding achievers from business, politics, academia and the arts, would bring about change with positive effects on a company's performance and bottom line. Our speakers can lift and reframe your thinking with their vision and experience of high achievement. While inspiration is truly priceless, we know that the investment of booking a speaker will provide you with significant returns for many years to come.